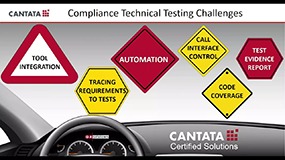 In advanced test management solutions, parametrized testing supports the re-use of test cases and the importing or defining of test parameters for test runs with many different parameters. Parameters are attributes with different values that describe the live environment. 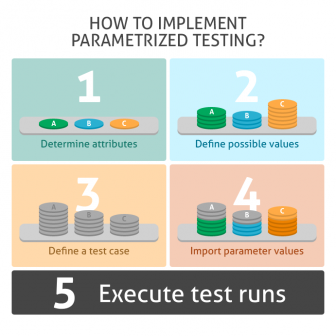 Without parametrization, users need to replicate test cases with each and every parameter, which is an effort-intensive process. Advanced test management systems make it possible to re-use test cases from other projects via a shared test case library. Parameters can be set according to the product failure profiles and describing them in the real live environments. Achieving a high maturity level of testing efficiency and accuracy requires having well-defined test cases in the library, and a good set of test parameters. Parametrization in an Agile software environment is particularly important. Agile is focused on shorter delivery times, yet developers are still required to maintain a high standard of software quality in order to fulfill customer expectations. Parametrized testing ensures more accurate testing, higher code quality, and faster testing procedures. Overall, using parametrized testing results in an increase in the overall software development and testing efficiency. How to implement parametrized testing? Determine attributes that fit the product profile. Let's take an example from the automotive industry: a car braking system test would need to be executed with varying speed and weight parameters. Define possible values of attributes that reflect real-life situations. Define a test case for the braking system by inserting the attribute: eg. : "speed" and "weight"
Import the parameter values table specific to the test case. Execute test runs with that set of parameters. Experts agree that Test Parametrization increases the overall quality of code, resulting in increased confidence in the code. codeBeamer ALM 7.3 supports Test Case re-use via shared Test Case libraries and test parametrization. Ready to try it? Start your free evaluation of codeBeamer ALM, or contact us to have all your questions about parametrized testing answered by our technical constulants.